University Liggett School is a private school in Grosse Pointe Woods, Michigan. Founded in 1878, it is Michigan’s oldest independent co-ed day school. In 2017, with enrollment growing, Liggett hired Detroit-area architectural firm Landry/Cekauskas to design a modern and functional new athletic center. The 30,000+ square foot facility includes a multi-purpose gymnasium, fitness and instructional spaces, locker rooms, and a spacious lobby to accommodate PE, as well as a variety of sports leagues and tournaments. It was a challenging project for the architects but the result was a success in both form and function. One thing that wasn’t a challenge, however, was when it came time to specify all of the door hardware. Architects typically turn to outside consultants for door hardware because it requires specific expertise. Landry/Cekauskas turned to trusted hardware consultant Robb Rittner, owner of Rittner French Associates. Robb was provided with the floor plan and door types, security and access requirements, and hardware budget. He took it from there to supply hardware product specs and pricing. Rittner chose hardware appropriate to the quality level, longevity and function required. Relative to other building items, hardware is not a big ticket item but is critical just the same. It has to function properly for a very long time, standing up to heavy and repeated use. More importantly, there are many types of codes to be aware of including safety, security, fire, ADA, and many others. Some of the doors in Liggett’s Boll Center had additional requirements such as access control points that need a card swipe to unlock the door, and doors on a timer to automatically unlock and lock at certain times during school hours. Rittner specified PDQ products including MR Series mortise locks, 6200 Series exit devices and 7101 Series closers for the Liggett facility. PDQ Locks is his main line for architectural door hardware. And, as Rittner explains, PDQ is “the highest quality, reputable, and a lot of their products are made in the United States”. 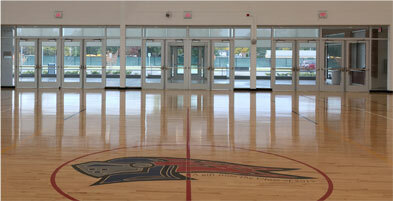 Liggett’s Boll Athletic Center was dedicated in September 2018 and has been successfully fulfilling its purpose ever since. It’s fair to say that PDQ was the MVP when it came to the lock and closure hardware.